Indonesia has committed to reducing its emissions from land use, land use change and forestry – by 26% by 2020. One way the country plans to meet this target is by reducing its emissions from deforestation and forest degradation through the REDD+ mechanism. By implementing REDD+, Indonesia will become eligible to receive financial payments based on forest carbon credits. A substantial amount of Indonesias carbon emissions are caused by deforestation and forest degradation from land conversion activities, forest fires and illegal logging, with the latter having significant impacts as a driver of deforestation. Therefore, initiatives to curb illegal logging will have to form a central part of any emission reduction strategy. 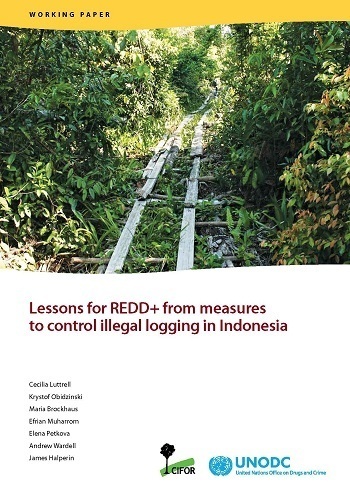 REDD+ has the potential to help reduce illegal logging activities by creating financial incentives to encourage compliance with the law, changes in behaviour and wider governance reforms. Since 2001, several initiatives in Indonesia have attempted to address the problem of illegal logging. These include international initiatives such as the Forest Law Enforcement, Governance and Trade (FLEGT) process; bilateral agreements between Indonesia and major importers of timber; and market instruments such as timber certification. National initiatives include joint security sweeps to combat illegal logging, anti-money laundering approaches to tackle illegal finance in the sector and the expansion of timber plantations to increase the supply of timber. This occasional paper explores ways in which the ongoing design of REDD+ mechanisms and institutions can benefit from these experiences. Authors: Luttrell, C.; Obidzinski, K.; Brockhaus, M.; Muharrom, E.; Petkova, E.; Wardell, D.A. ; Halperin, J.